All free accounts! No Premium accounts!! Directly share your photos, text, audio and videos with all your friends on your favorite social sites: facebook, twitter, flickr, vimeo, and more! Shoot n Share, it’s that simple! 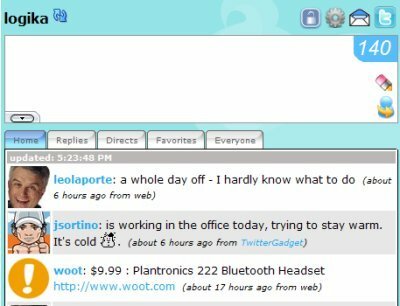 TwitterGadget is a clean, robust, web 2.0 style client for Twitter.com, designed to submit and view status updates via your iGoogle homepage, Gmail account, or directly in your browser. Brizzly – New from Thing Labs – A simple way to experience the social web! Great URLs and Analytics for Great Images. Twitgoo is a quick, easy, reliable, and safe way to share images for Twitter. Upload your pictures here or from hundreds of applications directly to Twitter. yfrog – Share your images/videos on Twitter! Share your images and video on Twitter with yfrog. AvatarSearch.org, this site allows you the user, to be able to search the entire Internet for an avatar that suits your personality. So weather you looking for an avatar about Dog or Frogs, Games or Shanes, you are bound to find one using AvatarSearch.! Just type your query in the search box above! IP2Location™ is a geo IP solution to help you to identify visitor’s geographical location, i.e. country, region, city, latitude, longitude, ZIP code, time zone, connection speed, ISP and domain name, IDD country code, area code, weather station code and name using a proprietary IP address lookup database and technology without invading the Internet user’s privacy. The database is also being used by Fortune 500 companies. Download your free copy of the demo database today. You are currently browsing the Share Web 2.0 blog archives for October, 2009.